Birthday banner clip art will make your banner design appear more creative and snazzy, letting the person you’re throwing the birthday party for realize that you put some time and care into the project. So we combed the web to find five sources to obtain some relevant clip art in an effort to greatly to assist you with this task. Along with the convenient links, you’ll get a brief review of the capabilities and variety at each of the five resources. If you’re looking for birthday banner clipart here, than you may already have this DIY project begun using a method familiar to you. If not, read How to Make a Birthday Banner for instructions on how to make one using common DTP software such as Photoshop or Microsoft Publisher. However, regardless of what application you’re using to make one, you’ll find a source below that you can use. At the top of the resource list is Clipart.com. For $14, you will get you a subscription for access to all their images. Thousands of birthday choices are available here which gives you a lot more creative leeway in the design process. More than enough options to get the job done for you are here. Incidentally Finding the Best Microsoft Clip Art Online is a great read for those of you that are taking care of this project using any Microsoft application. Using their resources might be a whole lot easier and cheaper too. 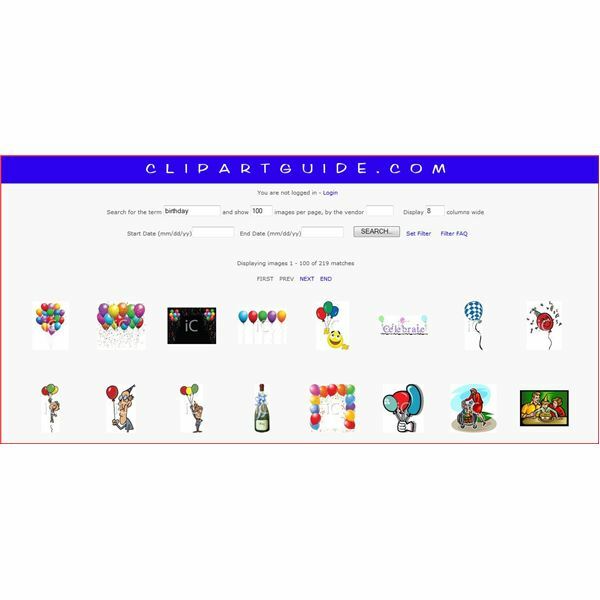 With over 200 birthday-related clip art images to choose from, Clipartguide.com will likely have something you would like to upload onto your banner. While a lot of them are catered for the kids, there are selections that can be used for adults and in something like an office setting or for the grandparents too. $12 will allow you a week’s worth of using images or if you foresee using clip art for other projects you can subscribe for derivations of time up to a year. I think it’s worth mentioning that a software application can be bought that will most likely cover any reason you’ll need clip art, including for birthday banners. Check out this helpful review and comparison guide to other products for more on that: Clip Art Guide: Clipart.com, Big Box of Art 410,000, and Art Explosion 800,000. A quick perusal will give you all the details on price and variety. Designedtoat.com is an excellent source for free clip art that is birthday related. Plus the process of downloading one to use for your project is as simple as a "right click" and "save as" procedure. The selection isn’t that extensive but some of them are free. iBand.com has some decent selections, some of which are free. If you’re just looking for cakes and cupcakes that are festooned with candles (without having to scroll through many options), than this is a good resource to use. You’ll have to register even for the free ones, although that’s not a big deal really. Now that you have a worthy arsenal of clip art to insert on your banner, all that is left is to plan the perfect party. And if you happen to find a better selection of Clip Art for this purpose, be sure and pass it along for us using the comment box below. Be sure and check out our site for assistance in all your other holiday crafts too.